July 21, 2014 admin 3360 Views 3 Comments black superhero, Dark City Comics, Indy Black Heroes, Lonnie E. Lower Jr. 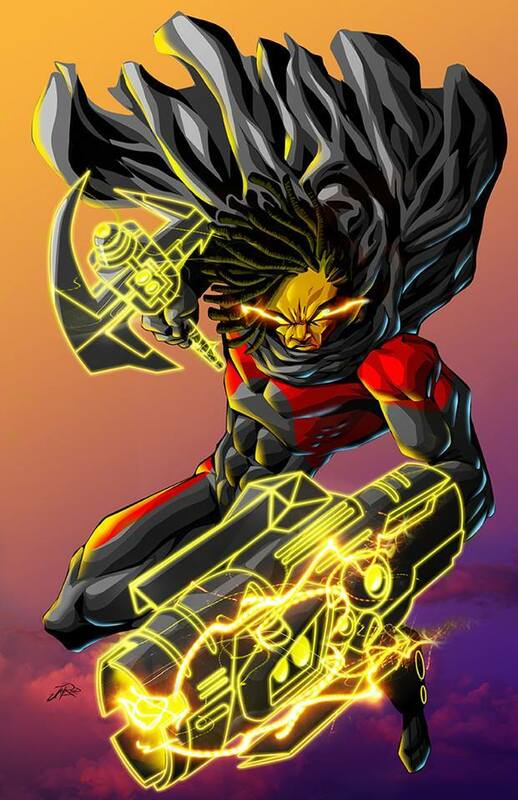 Powers: Using this powerful technology that lies within his Alpha bands Chris changes into Earth’s Protector In Crisis affectionately called Epic by the people of New Phoenix the most powerful being in the known galaxy. The Alpha Bands possess a vast database of intergalactic weapons and battle tactics that stretches across countless galaxies. This energy source is also a constantly learning, evolving and adapting power with a knowledge base that spans across the entire universe. He has flight, Alpha human speed, strength, agility, and reflexes. He can fire powerful energy blast as will from both his hands and eyes. Plus with the help of his alpha bands Epic can also manipulate said energy into any object within the Alpha Bands vast weapons catalog, seemingly pulling them out of thin air. During an archaeology dig in Egypt, star pupil Chris Taborn stumbled upon a set of artifacts that would change his life forever. The dig was part of a school field study funded by noted philanthropist Boris Zane proved to be nothing more than a scavenger hunt for an ancient relic though to be found in the Egyptian pyramids. During a series of twist, turns and murder Chris’s life would be changed forever once he inadvertently activated the Alpha Bands and releases a power on to this world it hasn’t seen for thousands of years. Now with his new found abilities come new responsibilities. Activated whenever he’s in the presence of an evil alpha Chris must train in order to help control and understand his abilities better. With help from the spirit of the bands’ previous owner The Pharaoh Udemses. Chris sets out on his new mission, Destroying all the evil Alpha’s of the world, whether he wants to or not. I like the concept and character….